A p-type Bi0.3Sb1.7Te3.0 thermoelectric semiconductor, which has a high dimensionless figure of merit (ZT), was prepared by milling at various milling rotational speeds. The milled Bi0.3Sb1.7Te3.0 powder changed from a partially alloyed state to a completely alloyed one with increasing rotational speed. The thermoelectric properties of Bi0.3Sb1.7Te3.0 sintered disks differed depending on the milling rotational speed. The minimum electrical conductivity σ, thermal conductivity κ, and maximum Seebeck coefficient α at the rotational speed at which the transition from PIES (pulverized intermixed elements sintering) process to MA (mechanical alloying) followed by HP (hot pressing) occurred. 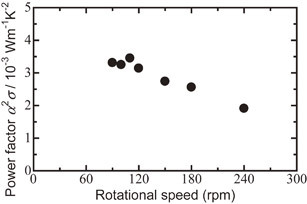 The ZT varied with changes in rotational speed, with a maximum value were obtained. This study have shown that the thermoelectric properties of materials prepared by powder metallurgy used milling were significantly affected by the milling energy, i.e., the rotational speed.